NASA’s International Space Station(ISS) is the third most brightest object visible in the sky after Sun and Moon. If we know exactly when to look up, we will be able to spot Space Station with naked eye and it looks like bright star moving. On the occasion of 12th anniversary of astronauts living in space station, NASA started a free services dubbed as Spot The Station, that alerts you when Space Station is visible from your backyard. SpotTheStation! Time: Wed Apr 25 7:45 PM, Visible: 4 min, Max Height: 66 degrees, Appears: WSW, Disappears NE. The space station is typically visible right at early morning or evenings when moon is the only one brightest star visible in the sky. The service is available world wide and almost 90 percent of the population on earth would be able to see clearly without using any fancy equipment. 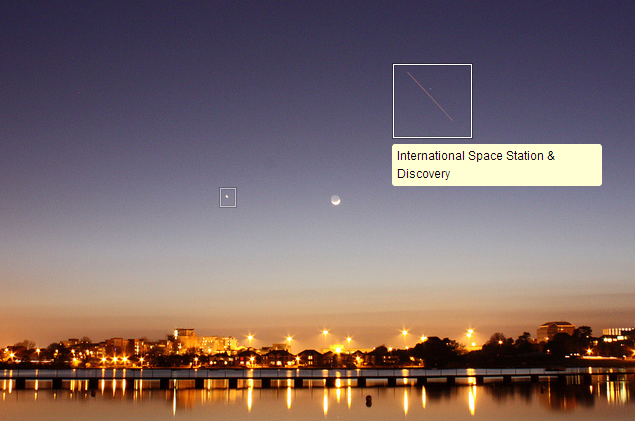 Follow the link spotthestation.nasa.gov to register for alerts.